Hazard and risk are often used interchangeably, but there is a significant and meaningful difference between the two terms. When scientists and policymakers carelessly substitute one for the other, the confusion gets compounded. A hazard is anything that has the potential to cause harm. As such, identifying a hazard is just the first in a series of steps to assess the danger a substance or activity might pose under a particular circumstance. By analogy, any body of water— puddle, bathtub, river, or ocean— poses a hazard because someone could slip on it, fall into it, or drown in it. To make intelligent decisions, we must know more to assess whether or not a substance or behavior is dangerous in real— world scenarios. A risk is the likelihood that a hazard will cause harm. Determining risk requires consideration of whether, how, and how much a person is exposed to a substance or activity. Using the same water analogy, there is little risk of drowning when one steps over a puddle of water. However, diving into the ocean without being able to swim poses a significant risk. To illustrate the difference between hazards and risks, consider water, gasoline and driving. They are all examples of everyday substances/activities that are hazards based on their potential to cause harm. 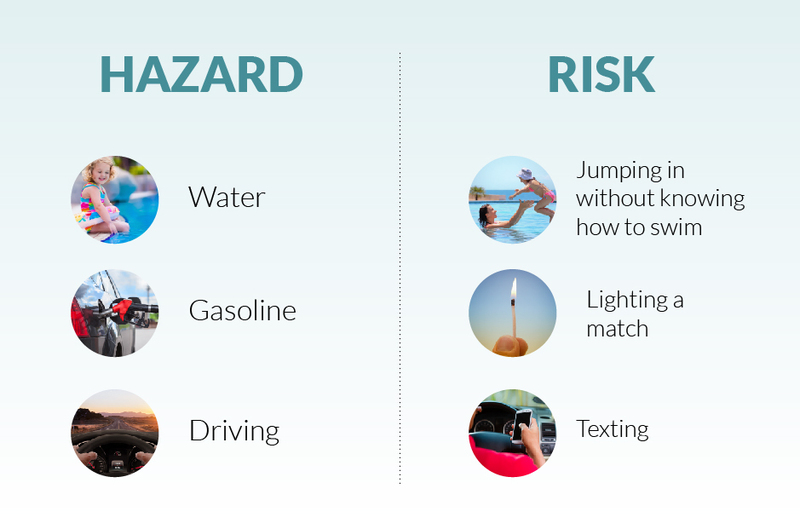 The potential of harm associated with each of these hazards is elevated when coupled with risky actions such as jumping into water without knowing how to swim, lighting a match near gasoline or texting while driving. A risk assessment takes a known “hazard” and evaluates its impact in real— world applications (as discussed in the illustration above), taking into account such factors as dose/concentration, exposure pathways, and probability of exposure to determine the likelihood that any given hazard will actually pose a risk of harm. Understanding risk allows us to safely use fire, automobiles, and the stove in our kitchen, while avoiding actions that would make these hazards risky. “The public sometimes misunderstands what IARC [the International Agency for Research on Cancer] means by its classifications. The agency says it assesses ‘hazard’ – the strength of evidence about whether a substance or activity can cause cancer in any way. It takes no account of typical levels of human exposure or consumption. So it is not measuring ‘risk’ or the likelihood of a person getting cancer from something.